One giant warrior king named Gilgamesh sets out on an epic journey to seek eternal life in a land filled with death. 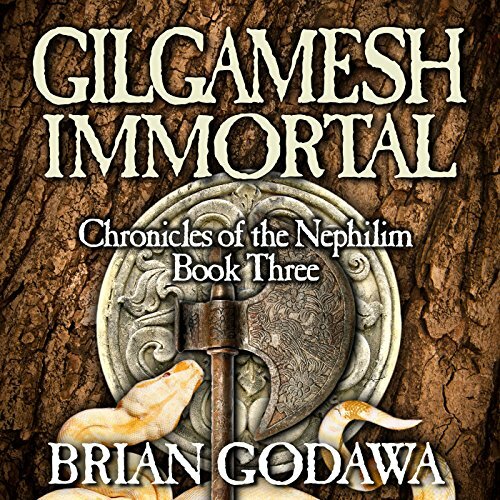 Gilgamesh Immortal is the third book of the Biblical Fiction Series Chronicles of the Nephilim, a biblical epic story of the fallen angelic Watchers and their offspring, the Nephilim giants of Genesis 6. Author Godawa shares the scholarly research that undergirds the ancient fictional action adventure. An appendix compares the Epic of Gilgamesh with the Bible. Well Crafted Overview of Mythic Culture in Bible..
Well crafted overview of mythic culture in Bible times! Gilgamesh is a heartless tyrant of a King who has his perspective changed by a “Wildborn”; a Tarzan-like fellow (only with a Lot more hair!). The heroics are fast moving and relentless as they face impossible odds together and conquer incredible foes of Biblical and mythical proportion. Why does the ancient writing “The Epic of Gilgamesh “ have so much in common with the early chapters of Genesis? In an appendix Brian Godawa explains the sources and concepts behind his well crafted and well acted out tale. The kindle version is better suited for young readers. The audio version has more sexual content. After reading while listening to this exciting tale, I understand more about the Bible’s use of Rahab the sea monster, and Leviathan, and also about Ishtar and the “sons of god” who were assigned to rule over the various nations. ...a painless study in the mythology that was well known during Bible times! really kept me going.. but had some boring parts. keeping up with the names..
What a joy it is to enjoy a unique series that is fascinating and interesting. It's like a badly written fanfiction by a 13-year-old girl who thinks she's a Biblical scholar. And it's written by a dude. What really got me was the author's claim that he didn't deviate from the Gilgamesh epic very much. Except he deviates from it a lot. There's so many dissimilarities between this book and the original epic, that I can't list them all here. My advice; go read a modern translation of the original epic. loved it great story. Spectacular insight great combination of truth and lies with explanation for references. Brian once again weaves truth with historical myths into a very compelling and interesting story line. I will continue with the chronicles. Loved the mix of legendary people with a story that caused me to listen to the whole book in a day.